How is the mesh on linear elements modified? i. Automatic - when this option is active, all the imposed/intersected structural elements will be connected and share common nodes. This option is useful when some structural elements should not interact with each other if they are two planar/linear elements or one planar and one linear. ii. Number - by entering a value in this field, the element will be meshed in that number of elements, without considering the value of the general mesh (global mesh options). iv. Spacing - this option is directly connected to Size and Secondary Size; when any of the other available options, besides uniform spacing, is used then this field must be completed. 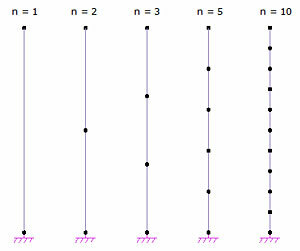 "Start" and "End" refers to the orientation of the local x-x axis (red axis), if the element is drawn from node i to node j then the local axis will be orientated positive from i (start) to j (end). 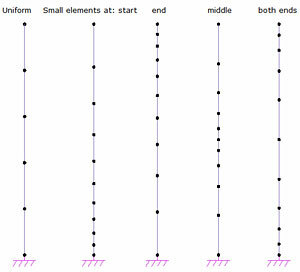 - Small elements at start - the length of the mesh will increase from the minimum size defined at Secondary size to the maximum value defined in the Size field in the positive direction of the x-x axis. - Small elements at end - the length of the mesh will increase from the minimum size defined at Secondary size to the maximum value defined in the Size field in the negative direction of the x-x axis. - Small elements at the center - the length of the mesh will increase from the minimum size defined at Secondary size to the maximum value defined in the Size field in both directions of the x-x axis starting from middle. - Small elements at both ends - the length of the mesh will increase from the minimum size defined at Secondary size to the maximum value defined in the Size field in both directions of the x-x axis starting from the ends of the element. 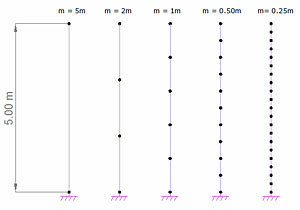 v. Secondary size - this field is the minimum dimension which will take into account the type of the spacing selected. 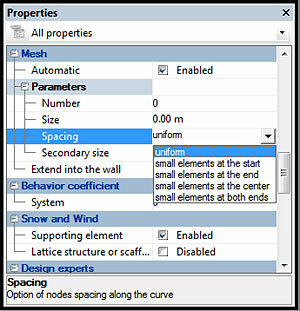 These mesh options are useful when linear elements are in the same plane as the planar elements and the general or manual mesh options of the planar elements are overwritten. In the extreme zones (corners) of the planar elements concentration efforts can appear and through the modification of mesh options of the beams, by setting a refinement at both ends, a better integration of the results can be attained both on the beam and on the slab. Sxx stresses on linear element at extremity "i"
vi. 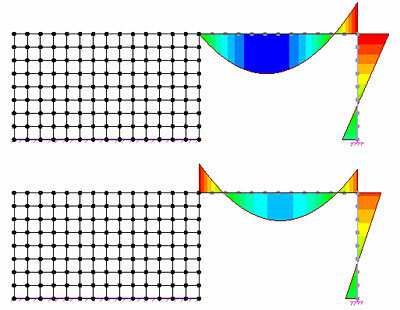 Extend into the wall - when a beam is supported by a wall (in the longitudinal direction), activating this option will create a rigid connection between the wall and the beam. 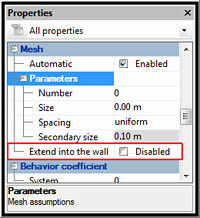 The difference between the linear element with the Extend into the wall option deactivated (upper) and with the option activated (lower) is depicted in the following figure.